Well I'm back online after a few days without Internet reception. Strange thing was that I still had phone reception and occasionally the Internet would float in because my emails kept updating but I couldn't actually get on the Internet. After leaving Kununurra we headed for the Bungle Bungles in the world heritage listed Purnululu National Park. 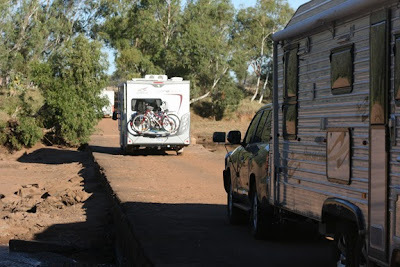 Originally we were going to stay at the free camp but thought it best for the security of Myrtle that we stay in the caravan park as we intended to be away all day exploring the Bungle Bungles. 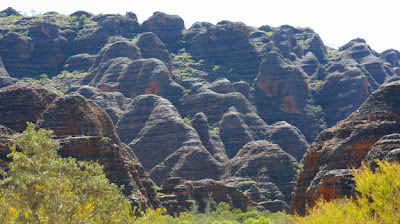 The Bungle Bungle range stands 300 metres above sea level above spinifex covered plain and is dominated by the famous orange and black banded beehive shaped domes. Because of Shane's limited fitness we decided to walk into Cathedral Gorge as it seemed to be pretty flat. 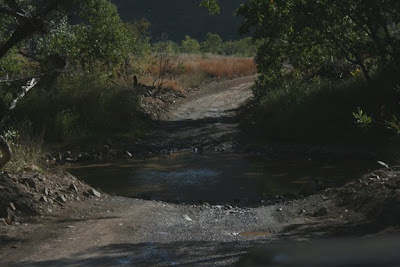 First of all we had to drive the 63 plus kilometres (one way) along a dirt, corrugated road. Other than the first half hour of bad corrugations the drive wasn't to bad. In total we had to cross 43 river crossings but as it is the dry season there was only water in five of them and out of those we only had to go into 4WD for one. That didn't stop me having a little heart attack at each lot of water we came to. But eventually we got to our destination and headed off on our walk, which ended up being about six kms. It was a great walk but might I say (excuse my language) bloody hot, probably about 35c!!! 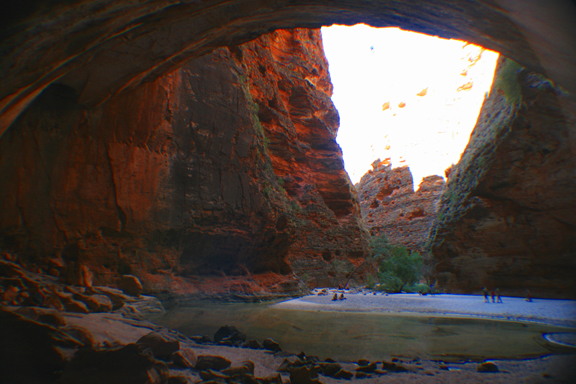 Firstly we walked in a loop around some of the beehive shaped domes and then onto Cathedral Gorge. As we entered the gorge not only did the sight of the magnificent natural amphitheatre blow our minds but the temperature dropped by at least 15c. That night after our big day we had retired for the night and in the darkness outside we heard something outside the van. Thinking it was a dingo or bird trying to get into our rubbish bag Shane decided to get up with his trusty torch and check it out. He opened the door slowly not to scare the native animal away and came face to face with a cow. Yes a cow of all things - I'm not sure who got the biggest shock Shane or the cow. So that sent us into fits of laughter probably waking the campers around us. Next day we were on the road again and decided (on another campers recommendation) to stay at a free camp called Mary Pool on the Mary River. This camp was really nice, right on the river (not that there was much water) and plenty of shade. We arrived around 1.00pm and there we a few vans already set up for the night. By the time the sun was setting there were probably 70 vans there for the night. We are now in Fitzroy Crossing for three nights before heading onto busy Derby and Broome. 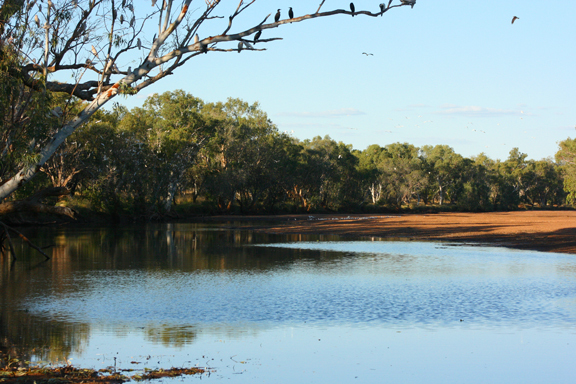 There's not a lot to see in Fitzroy Crossing, but there is Geiki Gorge which is supposed to be pretty spectacular. We are checking that out tomorrow, but for today it is a day of lounging around doing not much at all. 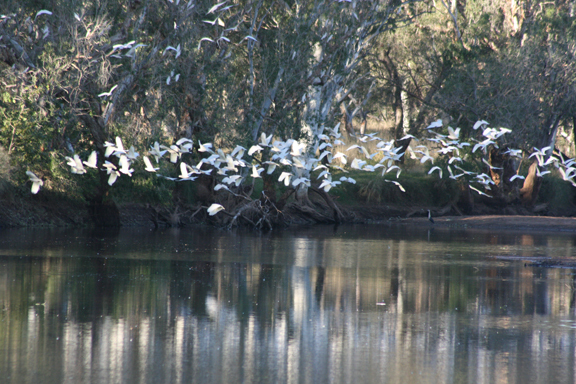 We live in such a beautiful country and once again am loving sharing it with you through your beautiful photos. But, I guess the only way to see it, is to do what you are doing and take a caravan. Yes Beverly we do live in a beautiful country. I am amazed just how much I am learning on my journey.